8/25/2017: While the Ducks are so broke they can’t pay for tutoring their student-athletes, they’ve got no problem paying Southern Utah $500K to show up and lose the football season’s opener next weekend. The contract is below. 10/13/2015: It’s not really a fair contest. While for years the UO administration has used its Public Records Office and their $300K budget to delay, redact, and charge excessive fees to frustrate the intent of Oregon’s public records law, the PRO’s at most other universities are in the business of making public records public. Here’s the latest example. 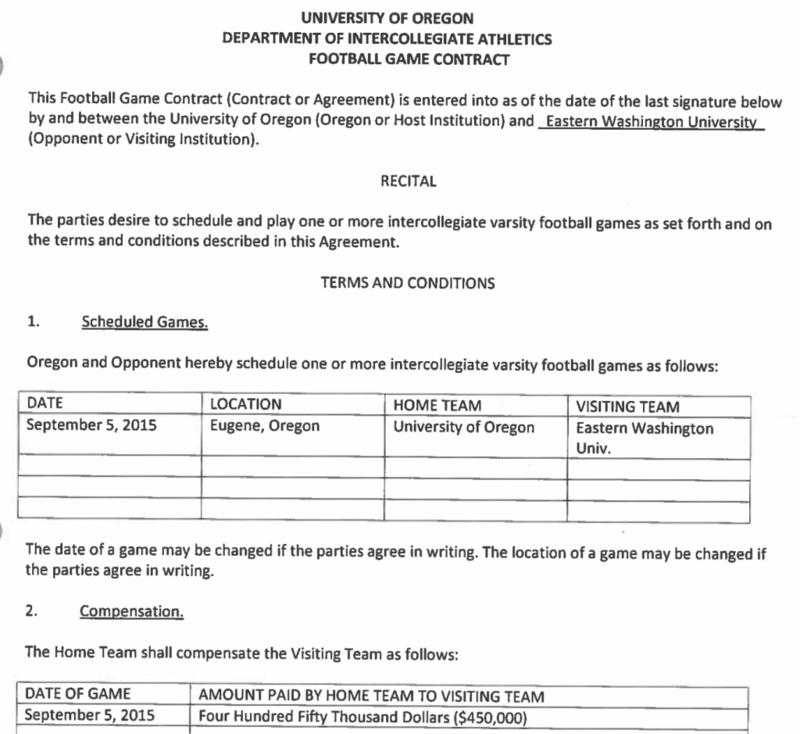 This is a public records request for a copy of the football game contract between SUU and UO, for the game to be played in the fall of 2017. I edit a news and opinion blog about the University of Oregon, and I ask for a fee waiver on the basis of public interest. I would appreciate it if you could send a pdf copy of this contract to this email address. 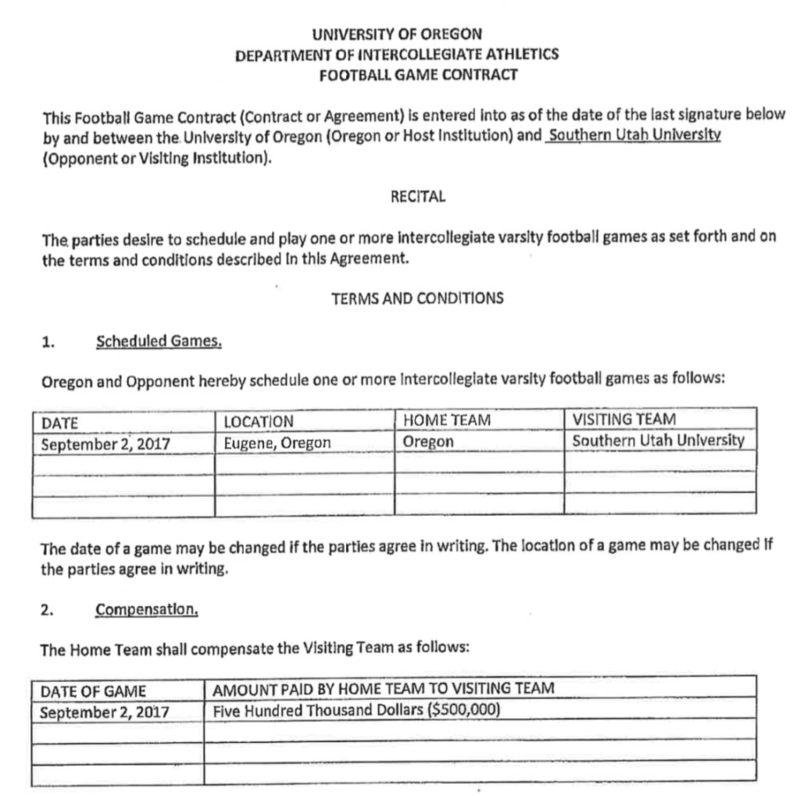 Attached is the contract between Southern Utah University and University of Oregon for a football game set for 9/2/17 in Eugene, OR requested 10/12 in the form of a GRAMA request. Not bad, though the record is still the 50 minutes it took Georgia State to provide their contract, and Eastern Washington’s General Counsel only took 3 hours. The 50 minutes it took Georgia State University to provide their contract with UO for Saturday’s football body-bag game is a record for the fastest public records response I’ve ever received. The runner up is Eastern Washington’s general counsel, who took all of three hours to provide the contract for their September 5 game with the Ducks. In contrast, similar requests to UO Public Records Officer Lisa Thornton and AAD Eric Roedl typically take weeks. Washington and Georgia’s public records laws are very similar to Oregon’s. The difference is that the University of Oregon ignores the law. Attached please find a copy of the request Game Contract. As this document is held electronically, there is no charge for requesting this document. More on this body-bag game here. Vegas has the Ducks by 46 points, making UO’s cost roughly $140K per net touchdown. No wonder Rob Mullens needs those athletic subsidies. 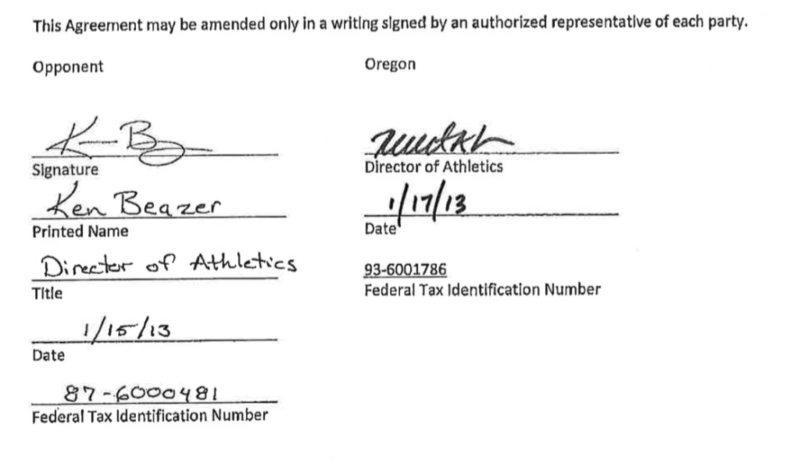 It took UO PRO Lisa Thornton 6 days to provide a contract that she’d given to Andy Greif at the Oregonian 2 weeks ago. This is a public records request for a copy of the contract or other agreement between EWU and The University of Oregon (or their respective athletic departments) for the EWU-UO football game that is scheduled for September 5 2015. An example of the sort of document I am requesting is at https://dl.dropboxusercontent.com/u/971644/uomatters/IAC/SDSU%20contract%202014.pdf. I would prefer to receive this by email, as a pdf. I ask for a fee waiver on the basis of public interest. EWU sent me the contract at 11AM Monday – 3 working hours after I requested it. No charge. Three hours is pretty quick turnaround, though Florida can be even quicker. In contrast, UO’s Public Records Office still hasn’t even acknowledged the request. Duck AAD Eric Roedl never responded. No documents. This is typical for UO. Maybe next week Lisa Thornton will send me the usual boilerplate, telling me that UO might have a public record showing this contract, and that if I pay $150 or so, they might start looking for it. Or maybe she’ll send me an estimate like the one below, for the Aon / Hewitt consulting reports. I wonder what Johnson Hall is hiding this time? The University of Oregon has received your public records request for “any UO public records contracts, invoices, or deliverables related to Aon Consulting Inc/dba Hewitt Assoc, dated from 1/1/2014 to the present” on 03/03/2015, attached. The office has at least some documents responsive to your request. By this email, the office is providing you with an estimate to respond to your requests. The office estimates the actual cost of responding to your request to be $591.98. Upon receipt of a check made payable to the University of Oregon for that amount, the office will proceed to locate, copy, and provide the records you have requested that are not exempt from disclosure. Your check may be sent to the attention of Office of Public Records, 6207 University of Oregon, Eugene, OR 97403-6207. The university has received your request for a fee waiver for these records. The decision to waive or reduce fees is discretionary with the public body. After considering your request below, the office does not consider that the totality of the circumstances you presented meets the standard for a fee waiver. Please note that if the cost of preparing the documents for you is less than the estimate, we will refund the difference. If the cost of preparing the records for you exceeds the estimate, however, you may be charged for the difference. Following is an outline of how costs are determined. The office will provide the documents electronically to avoid a copy fee of 25 cents per page. The office also charges for the actual cost of making public records available. The charge includes, but is not limited to, staff costs for locating, gathering, summarizing, compiling, reviewing, tailoring or redacting the public records to respond to a request. The charge may also include the cost of time spent by an attorney in reviewing the public records, redacting material from the public records, or segregating the public records into exempt and nonexempt records. The cost of time for each employee is calculated by multiplying the employee’s hourly wage calculation (including benefits expenses) by the hours or portions thereof necessary to locate, gather, summarize, compile, tailor, review, redact, segregate, certify or attend the inspection of the public records requested. Thank you for contacting us with your request. 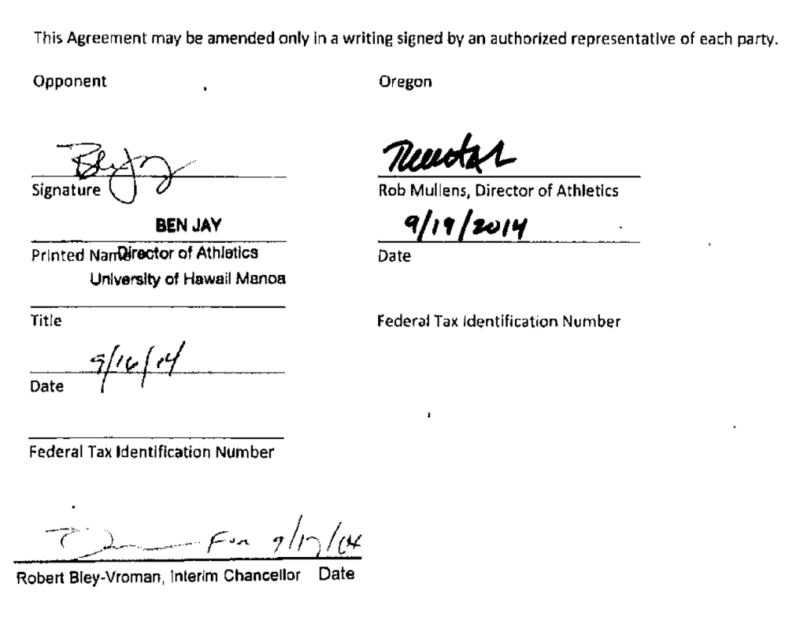 Tagged athletics subsidy, Eric Roedl, Public Records. Bookmark the permalink. 13. Lisa Thornton (NR): Public Records Officer at University of Oregon is the custodian of ■■■■■■■■■■■■■■■■■■■■■■■■■■■■■■■■■■■■■■■■■■■■■. She ■■■■■■■■■■■■■■■■■■■■■■■■■■■ transparency. ■■■■■■■■■■■■■■■■■■■■■■■■■■■. Public benefit and state law ■■■■■■■■■■■■■■■■■■■■■■■■■■■■■■■■■■■■. ■■■■■■■■■■■■■■■■■■■■■■■■■■■ citizens have a right to know. She might be higher on this list if … ■■■■■■■■■■■■■■■■ and ■■■■■■■■■■■■■■■■■■■■■ sunlight! They got off light. Several of UO’s comparator schools in the Big 10 and ACC routinely pay $600k+ for a home matchup against a D1A school. And who knows. EWU gave UW all they could handle in Seattle last year, and two or three years ago they straight up beat OSU at Reiser. I think Michigan spent 500k to lose to Appalachian State at home a few years back. Maybe Eastern Washington replied in 3 hours because they get one or two such requests a year. UO receives one or two such requests an hour from UO Matters it seems, the vast majority of which are frivolous and requested simply to cause trouble. Talk about administrative bloat. We could probably hire several new tenure track faculty with the money we waste each year dealing with this garbage. UO is a public university in meltdown. As of this June we’ll have had 6 presidents in 6 years. People want to know what’s going on here. And they don’t trust the president of the day, or Tim Clevenger, or Tobin Klinger, to tell them. This blog is getting about 4K pageviews a day – more than UO’s official “Around the 0” news blog. So yes, of course I make a lot of public records requests, and I’ll be making more. UO 4 ever, it’s because of kiss ups like you (and the asses that pat you on the head after) that this university’s core missions are fading fast. It is entirely relevant and not frivolous for the public to know about the excesses and twisted perspectives that go along with our athletics program. If Eastern Washington gets many fewer public records requests, it might be because it promptly and appropriately responds to requests informally — as the UO once did, years ago. Most requests, if they’re for specific documents (not trolling through large files), are often easy to accommodate in minutes or hours, not days (unless the responding office’s files are in disarray). The problem here is that the process has become adversarial, not collegial. Sharing information related to the public’s business is not “garbage.” It’s what public institutions are supposed to do. Wrong, wrong, wrong, which you’d know if you’d ever made a public records request from UO yourself. It takes UO the same three hours to find the records, and then it takes them another three weeks to decide what they’re going to show you. Other schools skip the second step. I think we’re saying the same thing. But on the same topic, maybe someone should compile statistics about the cost to the institution providing the records per disclosed public record “information unit” (since delayed, redacted, and nondisclosed records are much less information-dense). If we pretend for the moment that the purpose of the UO Public Records Office is to provide information to the public, UO is getting appallingly little bang for the buck. Your administrative waste is there, not in the number of requests received. Actually, in the past, it was more like three months. My guess is that bodybag games are extremely profitable, with the $450k being appropriately viewed as a direct cost in the P/L. My guess is that the lower risk of a loss financially outweighs the alternative of paying less for a higher caliber team. If my guess is correct, then you seem to often paint an unfair picture of Athletics in general. As you said, this is really about public records disclosure. If half a million is the going rate–whatever the reason–for the perfectly standard practice of paying for bodybag games, then why not just put every one of the damn football contracts in the “public records reading room”? Why does the header say 1.5M? 500k goes to Oregon. It is 500 per home team for the first two games, and UO is the visitor for one of them. The home team pays the amount. 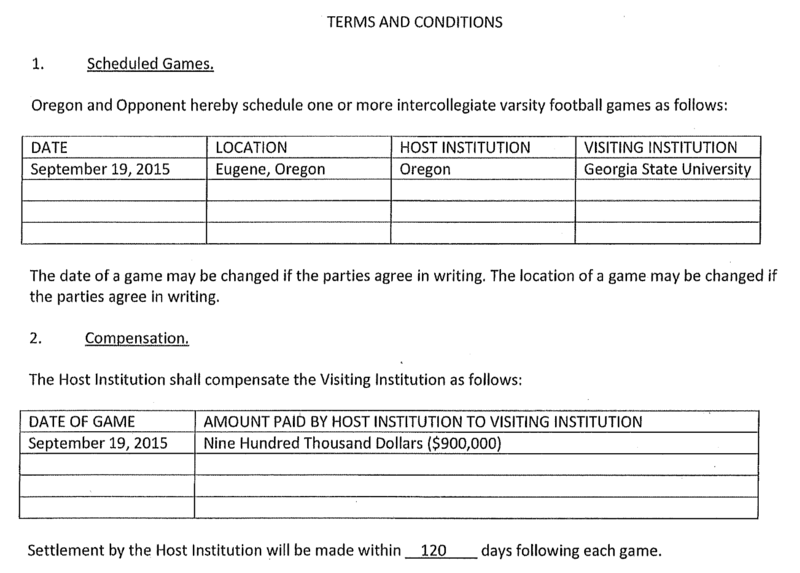 Oregon is at home twice, and will pay $1M and $0.5M to Hawaii for those games. 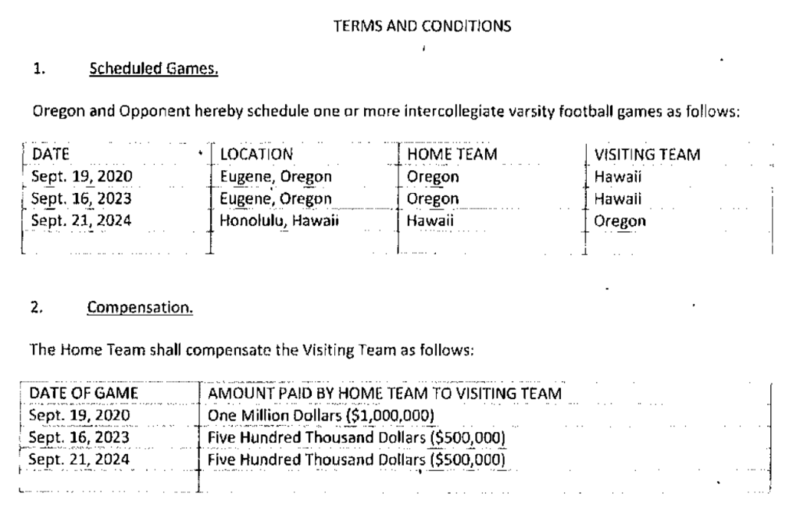 Oregon is at Hawaii once, and will get $0.5M for that game. 1+0.5-0.5 does not equal 1.5 either, but does reflect what UO is paying Hawaii. Actually, 1M+0.5M – 0.5M = 1M.